It was an amazing weekend. I spent Friday and Saturday at the Army 10 Miler expo, working at the Code of Support Booth – and met some awesome people. Two wonderful ladies from Illinois representing Operation Support Our Troops America – got some rubbed off glory since they have had The Lt. Dan Band come and play at a concert they sponsored… sigh…Gary Sinise! Talked to many members of our military community, who have been stationed in so many places, met civilians who want to support military families – and a few who were really pissy when we wouldn’t let them have any candy unless they signed the pledge – one even threw the candy back in the bowl and stomped off! Silly woman. 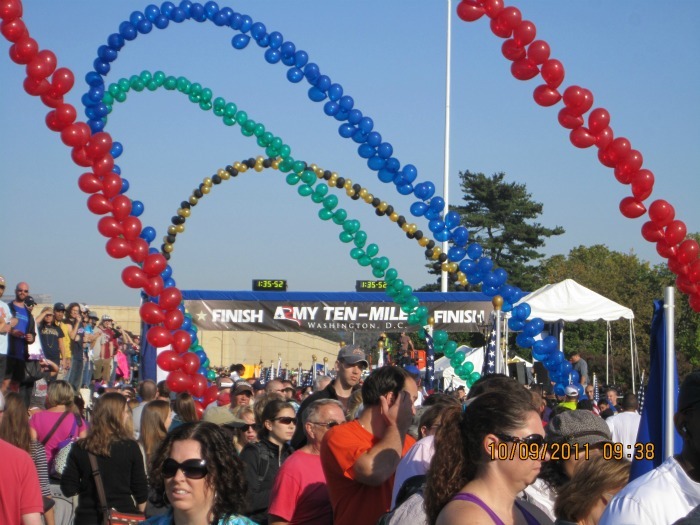 But Sunday – the day of the 10 miler was a great day. it was sunny and brisk, and thousands of people thronged the parking lots at the Pentagon. The music was loud, the announcer even more so I usually go to this with my husband, getting there at oh dark 30 min. cold, watching everyone stretching and doing all the incomprehensible things that runners do before a race. he called me this time just as the first few runners began to cross the finish line. Watching the wounded coming across in those racing chairs, was as always inspiring. I’ll be at AUSA for the next couple of days. I’m hoping that the presentations concerning families won’t be the same thing that I’ve heard for the last three years. We hear promises,we hear of new programs, we are told that we will have our concerns heard. I continue to hope that even with the budget cuts that we know are going to be coming down, the powers that be will realize that our families need help. Last Friday was the 10th anniversary of the start of the Afghan war. We know how tired we are, we know that our families are stressed and stretched.